Kaleb and I are selling True Mercy at the Woods Winter Wonderland Market. 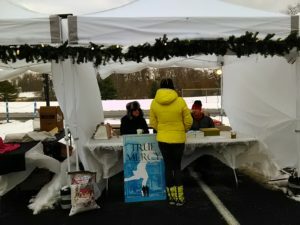 This past weekend my family and I sold my novel True Mercy at the Woods Winter Wonderland Market in Langhorne, Pennsylvania. Woods is an educational and residential center for individuals with various disabilities, including autism, brain injury, developmental disabilities, emotional and behavioral challenges and Prader-Willi Syndrome. It was founded in 1913 by Mollie Woods, a Philadelphia teacher who began the school for children with special needs. Woods is now a 350-acre campus and services 700 residents. While selling my book, I observed a warm community environment with fun activities for all, including pony rides, face painting, and holiday lights. Booths were set up selling holiday crafts by local artisans and a choir sang holiday songs. Vendors served food and warm drinks. I spoke about one of my novel’s goals as giving readers a peek into the stresses and challenges of taking care of a loved one with autism. Despite the hardships, these individuals have a sweetness and innocence that others find endearing. Adam, the eighteen-year-old character with autism in my novel, always managed to put a smile on people’s faces as he played an instrumental role in saving a woman’s life. 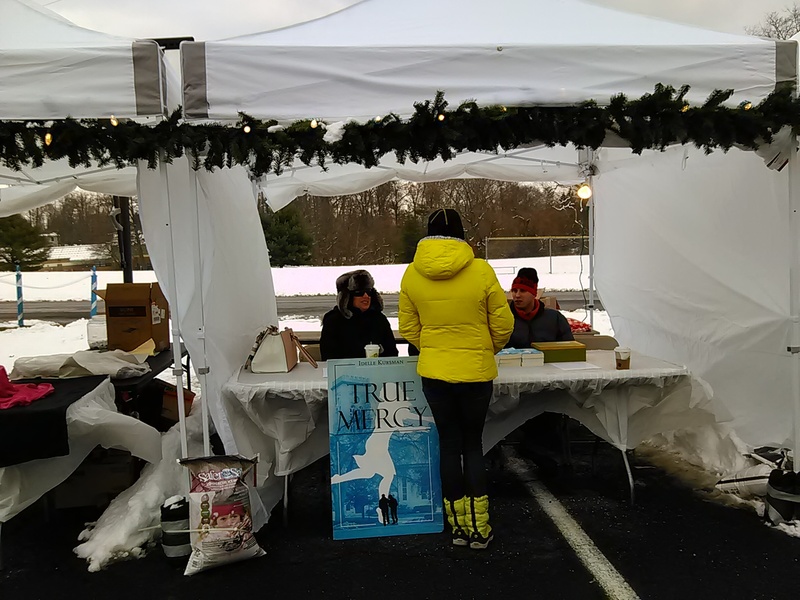 Everyone had a pleasant day at the holiday market and I was pleased to talk to so many people about True Mercy. In the ranking of Presidents, I had always learned that President Ulysses Grant was ranked one of the worst. However, after reading Ron Chernow’s thoroughly detailed biography, I came away with a different perspective. Before becoming the general leading the North in the Civil War, Grant was a failure at every business venture he undertook. But he never gave up. After leading the Union army to victory, he became President of the United States and had a mixed record: Grant displayed great bravery in trying to protect newly-freed black slaves in the South and defeating the Ku Klux Klan, yet he naively surrounded himself with corrupt cabinet members. He had a tendency toward alcoholism but spent most of his life overcoming his addiction. Grant himself was an honest man, but his judgment was often flawed in maintaining loyalty to close friends who betrayed him. Despite his shortcomings, I came away with the utmost respect for Grant as both a brilliant general and an upright man. A life of many failures and successes, he demonstrated that luck can change.